One of the primary differences between Eastern and Western Christianity concerns the nature of authority in the church. I’ve already explored this issue here, so I won’t repeat myself. However, I will mention a few points that I may have missed. The Eastern Orthodox concept of Tradition is quite difficult for the Western mind to get around, as it really fails to fall in any Western category. The Church Fathers, whose teaching is part of the Orthodox Tradition, are not considered infallible; that is, even highly respected Fathers had some teachings which have been rejected as being heterodox. 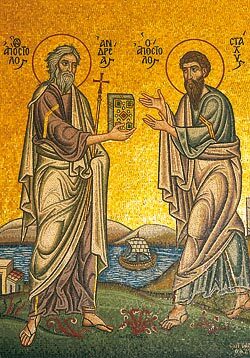 The Church Fathers are respected not because of their historical proximity to the Apostles, but because their revelation and teaching is seen as apostolic. Revelation is seen as continuing. Not that it is progressive, but that God continues to reveal Himself as he always has. The liturgy is also authoritative, as it reflects apostolic teaching. Tradition guides the church, however it is the church – not the leaders – who decides what is Tradition. The authoritative teachings of the later Fathers and the decisions of the Seven Councils – such as the decision concerning the veneration of Icons, or the incorporation of apophatic theology – is said not to be anything new, but to be what the Church has always believed. As suggested in #6, to the West, the Eastern concept of Tradition appears somewhat circular: Tradition controls or guides the Church, but is also decided – or perhaps revealed – through the Church. There also seems – to Western eyes, anyway – that there is a presumption that whatever the Orthodox Church currently believes is what the Church has always believed, and is therefore in line with the Apostolic Tradition. For example, take the veneration of Icons, which was debated at the 7th Ecumenical Council, I believe. The Orthodox Church has not always venerated icons, and it certainly isn’t found in Scripture. However, once it was settled in favor of icons, it became Tradition. It is also interesting that certain teachings of certain Church Fathers have at been accepted at certain times, and not accepted at other times. For example, if I recall correctly, the teachings of Pseudo-Dionysius were not really accepted until St. Gregory Palamas, who referred to him as “an unerring beholder of divine things.” It seems, then, that Tradition is hardly a straight line. I’m sure that my Orthodox friends can bring some clarification on this point, which would be welcomed. Next in the Series: More thoughts on items from my list of East-West differences. My current series is Exploring the Twain, in which I offend (unintentionally) evangelicals, Roman Catholics and Eastern Orthodox alike. I am, at this point, an equal opportunity offender. The intent of the series is to examine the differences between Eastern and Western Christianity. My hypothesis is this: Western Christianity has been so impacted by philosophical forces – including but not limited to Neo-Platonism and Modernism – that the only way to examine it is in light of the Eastern Church, which purports to have preserved the original Apostolic Christianity without change. So far I have looked mainly at the early history of the Western Church, with an emphasis on the Neo-Platonism and Manichaean influences of Augustine, who is still technically revered by the Eastern Church but is occasionally called a heretic. Augustine, in my opinion, did indeed have some wacko ideas which has skewed Western Christianity, such as the concept of “original sin” and our inheriting Adam’s guilt. Luther corrected much of Augustinian thinking (not all), but Calvin took the rest of the church (what is now evangelicalism, even if you don’t consider yourself Calvinist) further down Augustine’s path. More on that at a later time. While all this was going on, the Eastern Orthodox Church was basically ignored by the West, and vice versa. Most Augustinian writing was not even translated into Greek (the adopted language of the Eastern Church) and again, vice versa. In looking at the development of the Eastern Church, I have been reading numerous articles and books, such as Berkhof’s The History of Christian Doctrines, Three Views of Eastern Orthodox and Evangelicalism, and Encountering the Mystery by Ecumenical Patriarch Bartholomew, the head of the collected Orthodox churches. What I have found in my reading so far is that this is not necessarily an easy task. It’s almost like speaking 2 different languages. Which, I should add, explains much of the misunderstanding by the West. I found it interesting that nearly everything I read that was critical of the Eastern Church was written by a Calvinist. And, like most such critiques by Calvinists, they mostly pointed out where the Orthodox were wrong for not being Calvinists. This, by the way, isn’t helpful – and I find myself siding with whoever isn’t Calvinist, simply for that reason. I also found it interesting that those who attempt to bridge the Twain, such as Bradley Nassif and Timothy Ware, are occasionally criticized by other Eastern Orthodox folks for being too Westernized. Besides the Augustinian gap, there is also a pre- and post-Enlightenment gap that many of the Orthodox really don’t seem to like to cross. Consequently, reading Bartholomew’s book was often a challenge, as my Western-category questions were not getting answered. Instead, I occasionally felt like I was reading some book on Zen; the Eastern thought process is often that different. My hypothesis, which I mentioned at the outset of this post, seems to have, in part, failed. Based on my reading to date, it seems that while the Eastern Church lays claim to the unchanged Apostolic Faith, they too have been impacted by Neo-Platonism. While this is a fairly common charge, and one which is typically denied by the Orthodox, it does seem quite obvious and even seems more pronounced (although taking a different turn than Augustine’s). My next post will deal with the Neo-Platonist influences in the Eastern Church. If you are an evangelical, how do you – or would you try to – understand Eastern Orthodoxy? If you are Orthodox or familiar with the Eastern Church, what do you see are the major issues between East and West?